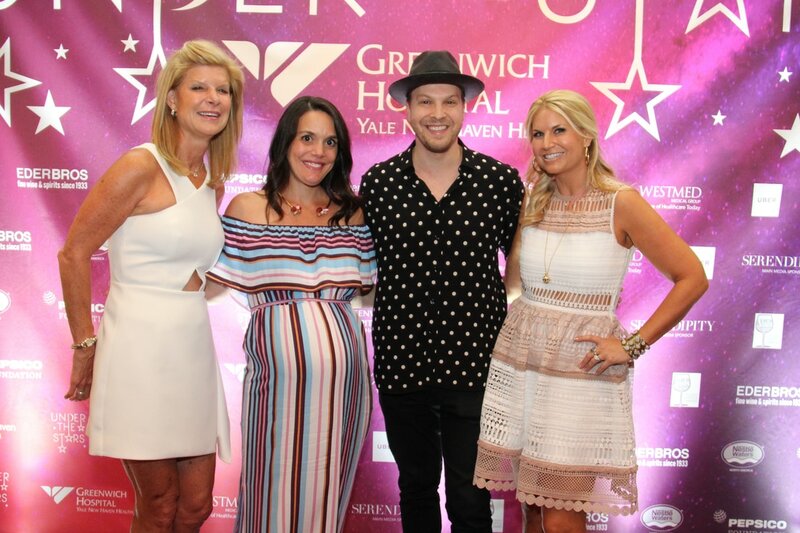 Guests were delighted by the soulful rock sound of Gavin DeGraw at this year’s Under the Stars event that raised over $700,000 for Women’s and Children’s Health at Greenwich Hospital. DeGraw is a GRAMMY® nominated, multi-platinum selling singer and songwriter, who performed many of his chart topping hits including "Not Over You," "I Don't Want To Be," “She Sets The City On Fire” and his most recent hit song, "Making Love With The Radio On." The June 24 benefit took place at Riverside Yacht Club and drew a crowd of music lovers and hospital supporters alike from Fairfield and Westchester counties. Greenwich residents Karen Brown, Andrea Sinkin Jaffe, Carol Swift and Jennifer Turano served as this year’s co-chairs. A generous gift from the Greenwich Hospital Auxiliary was received last week in support of the event’s “Wish List”, a selection of items compiled by the hospital’s physicians and nurses based on their immediate needs. The Auxiliary donated funds to purchase a Halogic Affirm™ prone biopsy table. This state-of-the-art device will add to the comprehensive services provided at the Breast Center at Greenwich Hospital by making minimally invasive breast biopsies available for a wide spectrum of patients. Additionally, the Auxiliary donated funds to the Pediatric Emergency Medicine unit to further enhance the specialized services provided to children and adolescents in the Emergency Department. Popular local disc jockey, DJ April Larken entertained the crowd upon arrival. Attendees enjoyed cocktails and hors d’oeuvres while bidding on exciting silent auction offerings including one-of-a-kind experiences, autographed memorabilia and high-end wines. VIP ticket holders enjoyed a meet and greet with Gavin DeGraw in an exclusive lounge area within the clubhouse followed by dinner on the patio overlooking Long Island Sound. A chic décor concept created by Sebass Events and Entertainment included stunning floral arrangements with roses and dahlias in the event’s colors of tiger lily orange, cerise pink and mystic burgundy. Emmy award-winning correspondent for CBS News, Jeff Glor, served as Master of Ceremonies. During the evening’s program, Greenwich Hospital President Norman G. Roth noted the broad range of women’s and children’s health services that will benefit from the event. “Our medical experts care for the tiniest newborns up to very complex cancer patients, all right in our community,” he said. In thanking the audience and volunteers, Roth recognized that support from the community is what helps the hospital attract top clinicians, purchase the latest in technology and stay ahead of the latest developments. A rousing live auction was led by Christie’s auctioneer Caroline Ervin. Items up for bidding included fantastic trips to Anguilla, Mexico and the Bahamas; tickets to see Billy Joel live at Madison Square Garden; a sports package including tickets for all the popular New York teams; and an animal portrait by world renowned artist, David Yarrow. After the performance, partygoers closed down the house dancing to music spun by DJ Flips before heading to an after party at Little Pub, Greenwich. Women's and children's health services include pediatrics, maternity (obstetrics), gynecology and cardiovascular services, as well as specialized services in our NICU, Breast Center, Fertility Center and resources provided by Community Health at Greenwich Hospital. For more information on supporting women’s and children’s health, please visit https://giving.greenhosp.org/underthestars. Greenwich Hospital gratefully acknowledges support from many philanthropic individuals and the following event sponsors: The Allatt Family Foundation; Altaneve; BCL Entertainment; BMW of Greenwich; Classic Kids Photography; Eder Brothers; Fairfield County Look; Greenwich Hospital Auxiliary; Greenwich Magazine, Moffly Media; Greenwich Sentinel; Hearst Connecticut Media Group; J. McLaughlin; Little Pub, Greenwich; Nestle Waters North America; Old Greenwich Social Club; Lite 106.7 FM, WLTW, iHeart Media; Pepsico Foundation; Sebass Events & Entertainment; Serendipity Magazine, Unger Publishing; Uber; Val’s Putnam Wines & Liquors; Vineyard Vines; Westmed Medical Group; Yale New Haven Health.